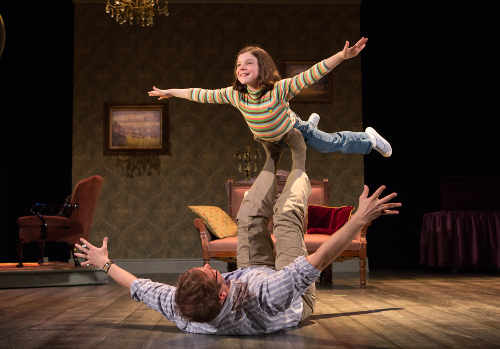 Fun Home, currently playing at the CAA Theatre, is one of those musicals that defies easy description. It’s so full of contradictions. At once funny and heartbreaking, uplifting and tragic, elegant and chaotic, it nevertheless balances all of these elements with expert precision and utter commitment to all of the messy, complex layers of its central plot: a lesbian cartoonist attempts to draw a true, authentic portrayal of her gay father, and in doing so must confront the fact that he killed himself a mere four months after she came out to her family. Simply put, Fun Home feels like something new and innovative in the musical theatre world, and has since it originally opened on Broadway. This Canadian production absolutely upholds the reputation of the multi-award winning show (which includes the 2015 Tony for Best Musical).The family portrait drawn by Fun Home centres particularly on the relationship of Alison Bechdel (based on the real-life cartoonist Alison Bechdel and played at multiple ages by Sara Farb, Hannah Levinson and Laura Condlln) and her late father, Bruce (Evan Buliung). Importantly, the two never really discuss their shared queerness while Bruce is alive. Unspoken conversations and elusive details haunt “Big Alison” (Condlln) as she attempts to turn the story of her life into a graphic novel. Her perspectives as a child and young adult are lenses through which she struggles to understand her relationship with her father as an adult, as she works to render a troubled and complex man with authenticity. But to do so requires her to confront the fact that she has no access to his thoughts, emotions, or motivations leading up to the moment of his death, particularly since his emotional distance never allowed them to truly connect. As Alison draws, we see her recollect her own coming-of-age, her sexual awakening (particularly in one fabulously-acted number, “Changing My Major”, during which Sara Farb as Middle Alison somehow infuses lyrics comparing her first sexual experience to a thesis project with enough barely-restrained euphoria that it becomes deeply moving), and her own growth into her identity as both a lesbian and an artist. In contrast, we witness Bruce’s slow emotional decline and ultimate suicide. The two seem inextricably connected in ways that Alison struggles to understand throughout. With gorgeous music by Jeanine Tesori and funny, authentic lyrics by Lisa Kron, the score is both versatile and beautiful. Another standout from the songbook is “Ring of Keys” (performed movingly by Hannah Levinson), wherein Small Alison sees a butch lesbian for the first time and feels a sudden kinship. This is the one that actually got a tear or two out of me — it puts you in such a position of empathy, and even though many of the lyrics are funny, Levinson channels all the joy and excitement of recognition wonderfully. Anchoring all of this are a strong set of performances across the board. The three Alisons create a cohesive character together: Hannah Levinson (Small Alison) gives an impressively subtle performance packed with great vocals, while Sara Farb is endearing as hell as her character navigates a whole host of new emotions and experiences. Laura Condlln serves as a strong emotional anchor for the trio. Buliung, as Bruce, is both likeable and sometimes terrifying, adept at trembling his voice or tensing his body in such a way that we’re always aware of the roiling emotion beneath. Hats off, too, to Cynthia Dale, playing Alison’s ever-enduring mother Helen Bechdel, whose performance of “Days and Days” is a stirring message from mother to daughter. My guest, who saw the original show in New York, commented that this was his favourite of the two, acting-wise. We talked afterwards about how much of the strength of both the show and its performances were in its willingness to let the frayed edges show. It’s too bad that this show is being staged at the CAA Theatre, formerly the Panasonic. The sightlines are dreadful, and most of the audience was doing a lot of swiveling to see the action; this isn’t the show’s fault, but I do recommend trying to grab those front row mezzanine tickets if you can. At its heart, Fun Home‘s grappling with themes of identity, memory and family all cohere into a story that is messy, complicated, and perhaps, ultimately, unresolvable. Still, Fun Home is not so much about commemoration and resolution, but rather what it means to remember complexly and truthfully — and, most importantly, if such a thing is even possible. And Fun Home is one of those rare musicals that manages to balance intellectual complexity with raw emotional sincerity. There’s no reason not to see it. Fun Home is playing at the CAA Theatre, formerly the Panasonic Theatre, until May 6 2018. Tickets range from $40 to $90. Group rates are available for groups of 15 or more, call 416 593 4142 for details. Run Time: 100 minutes, no intermission. Audience Advisory: Contains mature content and strong language. This production employs haze. Recommended for ages 13 plus. Babes in arms or children under the age of 2 are not permitted in the theatre. Children older than 2 should be able to sit quietly in their own seats throughout the performance.